© Yamashita Kogyosho Co., Ltd. This is the world’s first magnesium violin, in which all wooden parts have been replaced with magnesium alloy. It is modeled on Stradivari’s ‘Le Messie,’ one of the world’s most precious violins. Japanese products, especially the high-precision handicrafts created by skilled artisans, have earned a proud reputation around the world. Down through the ages, superb production techniques born from associations between Japan and other countries have been painstakingly developed as cultural assets and skills unique to Japan. Traditional crafts, such as textiles, lacquer ware, ceramics, pottery and other earthenware produced by firing clay, and bamboo ware, have earned the world’s admiration for their beautiful designs and workmanship. They are all made with masterly skills that have been passed down from generation to generation. This very same tradition of craftsmanship has been inherited by industry and applied to cutting-edge industrial products in the high-tech and other fields. And now Yamashita Kogyosho, a Japanese sheet-metal processing company, has used its highly developed handcrafting skills to create an entirely new kind of product, one the world has never seen before: a magnesium violin! 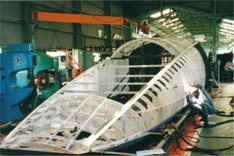 The Shinkansen nose section production process: craftsmen piece together curved aluminum sheets on a frame. Yamashita Kogyosho is responsible for manufacturing the nose sections of Japan’s Shinkansen bullet trains (the ‘faces’ of the trains). 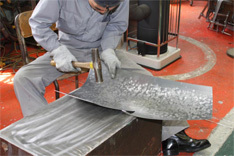 These streamlined noses are produced by craftsmen hammering aluminum sheets using a technique called ‘Uchidashi Bankin.’ With this time-honored technique they create delicately curved surfaces by hammering carefully selected areas of the sheets very precisely by hand, carefully controlling the strength of each blow. 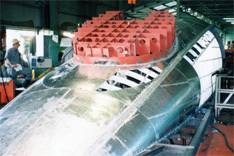 Since replacing this highly sophisticated production process by machine would require immense amounts of time, effort and money, the company entrusts it to craftsmen. When making violins the craftsmen reproduce the gentle bulges and intricate curved surfaces of the instruments’ bodies by hammering magnesium alloy sheets. It takes approximately three months for them to complete one violin. Masterly skills are apparent in such features of the violin as the gentle curvature of the front and back plates. 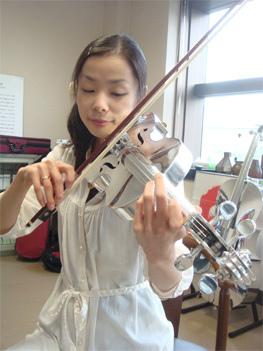 Yamashita Kogyosho originally created violins and cellos using aluminum, the material it employs in Shinkansen construction, in order to publicize its sheet-metal hammer-processing technique. 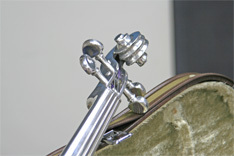 The first aluminum instruments weighed approximately twice as much as wooden violins, and thus were difficult to play. The company then turned to a magnesium alloy that is much lighter than aluminum, and reduced the thickness of the metal sheet to 1 mm. The result was a violin weighing 539 grams — almost the same as its wooden counterparts. A magnesium violin produces a vibrant, highly appealing sound which is different from that produced by a wooden violin, setting it apart as a new musical instrument. 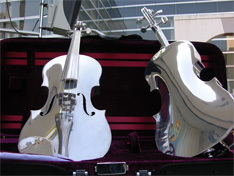 Magnesium violins were exhibited in Tokyo in November 2009, attracting considerable media attention. Ever since then requests from schools and municipal governments for exhibitions and performances at various ceremonies have been pouring in one after another. Yamashita Kogyosho plans to continue its work on the development of magnesium violas and cellos in pursuit of further weight reduction and other improvements. The day may well be approaching when we will be hearing string quartets performing with all-metal instruments! 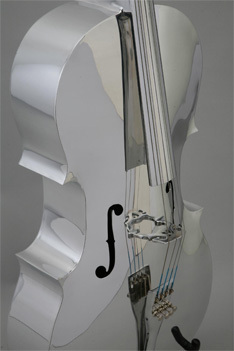 Yamashita Kogyosho-built aluminum cellos modeled on ‘The King,’ the world’s oldest existing cello. Magnesium violins not only weigh less than aluminum violins, they achieve superior sound vibrancy as well.